Growing up in war-torn Somalia, Abdi Nor Iftin narrowly escaped death more than a few times. Watching American movies provided a source of comfort to him and it's how he was able to learn English. But in 2006, Islamic extremists come to power and Western culture influences are not only banned but could have deadly consequences for Abdi. With the help of strangers who have been captivated by Abdi sharing his experiences on NPR and the Internet, he is able to flee to Kenya and eventually finds his way to America via the visa lottery. But does the land of the free meet Abdi's expectations? I feel like whatever I write in this review won't do this book justice. I really hope this book finds an audience because Abdi's life story is incredible and one worth reading. I read memoirs frequently, including ones that take place in war-torn countries, and I would place this book among the very best I have read in the genre. It took me on a roller coaster of emotions. His descriptions of his life growing up are heartbreaking but through it all his spirit somehow remains unbreakable. I can't say enough good things about this book and it's one I highly recommend! Thank you First to Read for the opportunity to read an advance digital copy! I was under no obligation to post a review and all views considered are my honest opinion. Abdi's Somalian parents were nomadic herders of camel and goats. His mother bore battle scars from the large cats she fought while protecting her herd. In 1977, drought left his parents with no option but to go to the city of Mogadishu. His father found work as a manual laborer before he became a successful basketball star. When Abdi was born in 1985, his family was living a comfortable life. Also in 1977 Somalia and Ethiopia went to war marking the beginning of decades-long military and political instability. Clan warfare arose with warlords ruling Mogadishu. By the time Abdi was six years old, the city had become a war zone and his family had lost everything had fled the city. Existence became a search for safety, with starvation and the threat of death their constant companions. Call Me American is Abdi's story of how he survived. Abdi tells of years of horror and fear yet there is no anger or self-pity in his telling. He and his brother Hassam used their wiles to provide their mother with the necessities of water and a little maize and milk for meals. When Abdi discovered American movies and music and culture he fell in love with America, and by imitating the culture in the movies became Abdi American. He envisioned a life of personal freedom. He taught himself English and then educated others. He was discovered by NPR's This American Life and he sent them secret dispatches about his life. After radical Islamists took power, anything Western was outlawed. Abdi was punished if he grew his hair too long and had to hide his boom box and music that once provided entertainment at weddings. His girlfriend had to wear a burka and they could no longer walk the sandy beach hand-in-hand. Knowing he faced the choice of death or joining the radical Islamic militia, Abdi pursued every option to come to America. The process is complicated and few are accepted. He fled Somalia to join his brother at a Kenyan refugee camp where his brother had gone years before. Abdi had his NPR contacts and even letters from seven US Senators (including Senator Stabenow and Senator Peters from my home state of Michigan) but was turned down. Miraculously, Abdi was a diversity immigrant lottery winner. The required papers were a struggle to obtain when they existed at all. He had to bribe police, and transport to get to the airport. He was 'adopted' by an American family but had to learn the culture and find employment. After several years Abdi found work as a Somali-English translator and is now in law school. I read this during the Fourth of July week. I don't think anything else could have impressed on me the privileged and protected life I have enjoyed. America has its problems, and when Abdi wins the green card lottery and completes the complicated process necessary to come to America he sees them first hand. I am thankful for the personal freedoms I have enjoyed. I have never had to sleep in a dirt hole in the ground for protection or worried that by flushing the toilet soldiers would discover me and force me into the militia. No teacher ever strung me up by the wrists and whipped me. I never dodged bullets to get a bucket of water. Somalia is one of the countries that Trump included in the immigration ban. Had Abdi not escaped when he did, he would not have been allowed to come to America. I won a book from the publisher in a giveaway. , Abdi Nor Iftin provides an indispensable and eloquent addition to the canon of American immigrant literature. Iftin adroitly relates his story of growing up in Mogadishu with parents forced to abandon their beloved nomadic life. Applying his intelligence, ingenuity, and curiosity, Iftin teaches himself English and American cultural tropes through watching American movies. Iftin becomes known in Mogadishu as “the American”, intermittently scrapes together a living by teaching English, and survives years of brutal civil wars. Through perseverance, good luck, and support from a small group of American and British journalists, aid workers, and physicians, Iftin wends his way from Somalia to Uganda to Kenya, and, eventually, the United States. is an inspirational memoir, which shows the United States as the beacon for immigrants that it once was. Tragically, Iftin’s monumental memoir may be the last of its kind. I received this remarkable memoir as a Giveaways winner. I want to thank Goodreads and Knopf. How many of us can fathom learning a foreign language from watching action movies? I can't. But that is exactly what Abdi Nor Iftin did. Growing up in war-torn Somalia, he began teaching himself English at an early age by watching films like The Terminator. His love of American culture, combined with a desire to escape a ravaged Mogadishu, led to a determination that is to be admired. Iftin’s story is harrowing, a life lived under unbelievably brutal conditions. Frequently beaten, often facing starvation, his life was one of dodging bullets while on the run to the next hiding place. Despite the horrors depicted, Iftin manages to have a surprisingly hopeful and upbeat voice. He maintains a firm control of both his story and his tone, never allowing it to slip into what could very easily be an unbearable read. The fact that Iftin did manage to finally escape the horrors of his country and write such an eloquent and moving memoir is simply extraordinary. The odds were never in his favor and, with the current travel ban in place, impossible today. ”. I can dream that reading a book could change the direction of this country and its immigration policies, can’t I? This is an eye-opening look at Somalia and the inspiring journey of a man who deserves to find a place here and to be called an American. Highly recommended. In the dictionary, as a definition to the word "optimist" should be Abdi Nor Iftin's photograph. He grew up in Somalia where he learned English by watching American movies (Arnold Schwartzenegger?) and listening to American music (Michael Jackson). He taught "American" to his friends and family. Once war breaks out in his homeland, he decides it is time for his dream - to move to America and become a citizen. His first step was to escape to Kenya where time and time again, law enforcement shake down Abdi and his brother, taking their cash instead of detaining them on a trumped (the author was horrified when the 2016 election results were known) up charges. Thankfully, he had made contact with some powerful people in the U.S. and out who couldn't always ease his way, but there were many rooting for him. Wonderful narrator, too. Recommend. Recommend. Recommend. Phenomenal, this has to be one of the best memoirs I've ever read. A riveting account of life in war-torn Somalia - even if memoirs aren't usually your thing I'd implore as many readers as possible to read Abdi's story. can't remember the last time a book made me cry this hard (maybe bridge to terabithia ?). I went all day after reading this book. It's harrowing to be reminded that life is so hard for so many people. Abdi gets a magic ticket that saves him from war, violence, and oppression--an American visa. I can relate. He won the life lottery and it makes me so sad that so many people have to leave their home country just to feel safe. Everyone should read this book and we should all work to do something about this. Studying Political Science, I spent many hours learning about unsuccessful peacekeeping operations and failed states. The ultimate example: Somalia, a country shaken by war, terrorism and ever-changing tribal conflicts so violent and complicated that it makes you feel desperate reading scientific texts about it - and they are of course rather detached in language. Abdi Nor Iftin was born in Somalia and lived through all of this, and his impressive memoir is so powerful not only because he writes in a very sober language that has great narrative force, but also because of his perseverance: While people around him were brutally murdered and his home country blasted and shot to ruins, many others lost faith and were mentally destroyed (which seems unsurprising, regarding what they had to experience), but Iftin somehow managed to fight on, trying to survive, to escape hunger and religious indoctrination and ultimately to flee Somalia. But his point is clearly not to portray himself as a hero, but to stand up for all Somali refugees who often have to endure discrimination and are frequently neglected and overlooked by the international community - Somalia is a relatively small (19th biggest in Africa), poor country which is mostly portrayed as a harbour for terrorists and pirates. But there are millions of people in and from Somalia who just want to live in peace. Abdi Nor Iftin is one of them. Most of the book tells the story of the multiple conflicts and their repercussions during the reign of Siad Barre, the Civil war and the rise of Al-Shabaab, including the reasons for the success of the terror organization. After fleeing from a drought in the rural areas, Iftin and his family lived in Magodishu, where the author was known as "Abdi American" due to his love for Western culture and his self-taught ability to speak English - and it were these exact things that made him a target for the radical Islamists. But would the country of his dreams grant him entrance and save his life? This Memior is about Abdi, who grew up in Somalia which is in constant war. We get a first hand account what it is like living in a country that is constantly at war. The hopelessness in this book was palatable. At one point the author described that his brother felt so hopeless he had to leave. 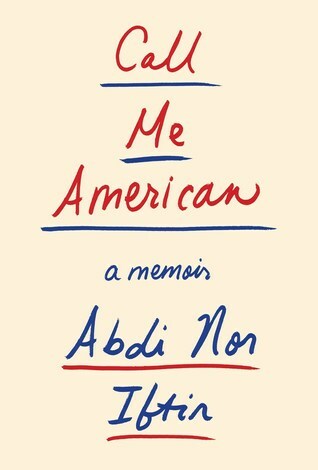 The book covers Abdi's life before and after he won entrance to the U.S. in the annual visa lottery and was granted a green card. This book is heavy and laced with violence and hopelessness. It will make you question humanity and where we went wrong but it is also required reading. is a book about the importance of imagination for someone whose life is filled with little beyond physical & geographic constraints in a war-torn flyspeck of a country called Somalia. The author, Abdi Nor Iftin uses his imagination & an inner reservoir of hope & courage to transcend many barriers & boundaries, only some of which are territorial, in a landscape largely controlled by tribal warlords in what would most certainly be called a country typified by excrement, to paraphrase an American president. How Abdi manages to succeed in his desire to become an American is a most fascinating tale, told by a young man who felt that he was at heart an American before he really had much of a sense of where the United States was situated on a map of the world. As some have had their lives altered & even transformed by a book or by an intersection with someone who becomes greatly influential, Abdi Nor Iftin becomes virtually addicted to American films shown with the aid of an unreliable generator in a dirt-floored hut in Mogadishu. Yes, Hollywood has been called a "dream factory" but seldom if ever has it been more true than in the case of a Somali boy who came to feel that "all the curses of the universe had descended on my family" but through American films comes to visualize a world beyond the destitution, disease, famine & tribalism of his native Somalia. This is the way it works for some who are in search of a dream, Abdi Nor Iftin among them: watching Arnold Schwarzenegger provides Abdi not with a ticket out of Mogadishu but with an alternate reality to contemplate & take aim at. Years before in Austria in the aftermath of WWII, Arnold Schwarzenegger became an immigrant to the United States after being uplifted by the Tarzan movies featuring Johnny Weissmuller, himself an Austro-Hungarian immigrant to America, arriving at Ellis Island in 1905 from a village in what is presently part of Romania. In my opinion, America must continue to serve as a place of refuge for contemporary Schwarzeneggers & Weissmullers, people fleeing the ravages of war, sectional violence & natural catastrophes, "huddled masses yearning to breathe free" and much like Abdi Nor Iftin, in search of a dream, which by its very telling, will enhance the United States or any receiving country. Abdi's family was nomadic & carried no real sense of nationality, with one's identity rooted in a particular tribe and in his their case, a rather small & powerless tribe. After the colonial powers that had partitioned today's Somalia into zones that were Italian (the south), British (the middle & part of the northern portion) & French (the extreme north that is presently a country called Djibouti) decided to fabricate a unified post-colonial country with the Italian & British parts, only the presence of a strongman named Siad Barre, kept the many tribes under a semblance of control. With the overthrow of Barre some 15 years later, Somalia fractured and drifted into a state of regional control by various militia, ultimately becoming a "failed state" without ever having had much of an opportunity to become a successful one. Abdi's family flees to the capital of Mogadishu in search of only temporary safety as the countryside is ravaged by warring tribes & then has to flee again, back to their old & very insecure homeland when the capital becomes embroiled in almost constant warfare including suicide bombings & the attempt to force young boys into militant militias favoring one clan or another. Abdi's dad is captured & led away, his little sister dies of starvation & at age 6 he is confronted with the notion that even relative safety seems beyond the grasp of Abdi's family & most Somalis. By 2008, Somalia had been at war for 17 years & drought further ravages the country but Abdi suggests that calling this living hell a "war" was too polite; instead, with a million dead & well beyond a million Somalis homeless "it is just endless gory terrorism on starving civilians who did not care which side won." Curiously, taking Koran classes, the only schooling Abdi has ever had provides him with some structure and later, having learned some English via the films he has watched + a few discarded books in that language, an older Abdi attempts to serve as an interpreter and using his own devices during a temporary lull in the battle for control of Mogadishu, even fashions himself as a teacher of English in an attempt to earn money. However, being called "the American" by some puts Abdi in even more peril. Eventually, Abdi manages to flee to Uganda & then to Nairobi in Kenya with the help of an American reporter he has met & others who see in him, a yearning that seems almost unquenchable. In time & against the longest of odds, Abdi wins an escape to safety via the "diversity lottery" and makes his way to Maine & a family willing to offer him shelter as well as safety in America. Like so very many, Abdi Nor Iftin carries with him the imprint of his native country, having left a brother in Kenya still in search of a new homeland & other family members back in Somalia who still must contend with constant uncertainty & continuing violence. But now, Abdi is able to send home remittances to assist his family back in Somalia. And even while safe in America, Donald Trump's condemnation of Muslims strikes fear in Abdi, even though as he departed for America he told his brother, "I am going to the land of the free & am done with fear".
. Let us wish Abbdi the same as his dream continues to unfold.